2009 is the United Nations’ International Year of Natural Fibres, so Anawol Alpaca Farm is celebrating by opening its doors to the public during National Alpaca week, which runs from May 2 – 10. Alpacas are bred exclusively as fleece animals in Australia, and yield between 1.5 and 4 kg of fleece each time they are shorn, usually once a year. The fibre is highly prized for its thermal qualities, durability and softness. Demand for the product always outweighs supply and commercial options for raw fleece exist with Australian Alpaca Fleece Ltd, which can be found at http://www.aafl.com.au and with local spinners. Commercial prices for home-spun wool can be up to $45 per kg according to the Australian Alpaca Association, while sales to home spinners can be considerably higher. 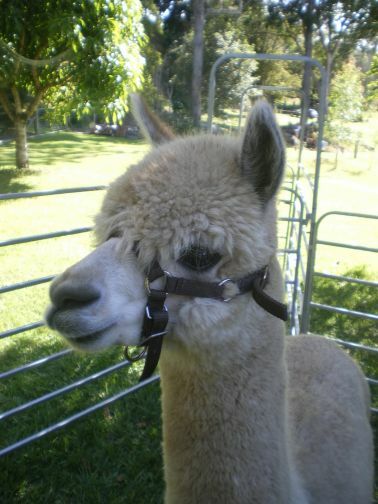 The Anawol Alpaca Farm is located at 16 Gibsons Lane, Bexhill, in New South Wales, and is operated by Peter Head and Suvi Paakonen, who run a breed called Huacaya. Suvi said, “We are just starting out, and at the moment we have seven pregnant females, two wethers (castrated males) and one young male.” They have been keeping Alpacas for about three years. They also offer spinning, weaving and felting demonstrations by members of the Lismore Spinners & Weavers Inc, who meet at McLeans Ridges Hall, Cowlong Rd, on the 1st, 3rd and 5th Fridays of the month from 10am to 2pm. Lismore Spinners and Weavers can be contacted at PO Box Wollongbar NSW 2477, or by phoning Lorraine Harris on 02 66242025 or Kay Hindmarsh on 02 66291510 . If you do visit Anawol Alpaca Farm, do not forget to call in to the nearby Bexhill General Store and try one of their delicious samosas with raita and the world’s most amazing, mouth-watering tamarind chutney, or select from one of their range of tasty curries or locally grown organic fruit that smells like fruit is really supposed to smell. « Stop! You must visit pretty Prague!